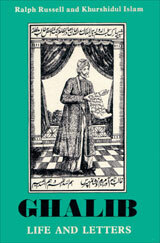 This book gives a comprehensive selection of the letters of Ghalib (1797 – 1869), one of the greatest poets of South Asia. He wrote voluminously in both Persian and Urdu and in both verse and prose. He is the most famous, and probably best-loved of all classical Urdu writers. Immensely popular during his own lifetime, we have innumerable reminiscences of him by his contemporaries which give a vivid picture of his independence and his openly avowed unorthodox way of life. His numerous letters to his friends and disciples in poetry are in completely informal style and fill out the picture. I have arranged the letters to tell the story of his life. A somewhat abridged selection is presented in The Oxford India Ghalib: Life, Letters and Ghazals. As an introduction to Ghalib’s work Ghalib, Life and Letters is inadequate in that it has nothing to say about his poetry although his work as a poet was the major element in his life. For this readers need to look at The Seeing Eye, which includes a comprehensive selection from his ghazal poetry.